Nucleotide Nutrition’s ground-breaking supplements are all 100% natural, vegan and free-from yeast, gluten, dairy, soy, GMO and lectins. 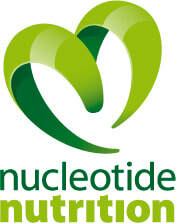 Nutri-tide®NT (Best Alternative Product winner 2017 - CAM magazine), includes the unique Nutri-tide® nucleotide formula (ingredient in 6 clinical studies; colds symptoms, stress (3), IBS and DNA repair). IntestAid®IB combines Nutri-tide® with B-vitamins for long-term digestive health and clinically tested with IBS participants supporting 3 main IBS symptoms.